I've got a decent sized table we bought from Costco set up in front of the television in the living room. This is just the right size to set up my sewing machine or drag out all my bead stuff and have a nice session beading. My eyesight isn't what it used to be so I also bought an Ott light which after I'd tried all sorts of other lights is the best one. Great light, no shadows and a true representation of what the colors are. That said, yesterday and the day before I got my first commission. This from my husband, DeeDude, who asked me for 10 bookmarks that they could sell for $5.00 each and give the proceeds to The MacArthur Metro. They had a celebration birthday party gathering last night for The Metro which is 20 years old. The Metro is our neighborhood newspaper and is a freebie to everyone. Hardly anybody on staff gets paid, so they are all mostly volunteers. DeeDude got involved with them 13 years ago after his back broke. He was a real estate loan broker in those days and the business was cut throat. He used to come home every evening snarling and all wound up. Then, he broke his back and he couldn't do much o f anything for more than a year after that. As he slowly began healing he got itchy for something to do. He wasn't well enough to work a full time job because he was only pain free for short periods of time. One day they had a want ad in The MacArthur Metro for somebody to write articles. He called them up and they told him to start writing. He never got paid for the work, but it was the beginning of a new career for him. He never went back to loan brokering or stock brokering. As his back gradually healed up he was able finally to go out and look for a paid job. He landed one with The Montclarion, another neighborhood newspaper in our area, but it paid money. He was with both papers for years and then we decided that he should take a year off and write for himself. He's written a bunch of history books. You can see them at his website Evanosky.info But, after awhile we needed him to go back to work again. He enjoys his work now at The Alameda Sun. All that aside, here are the bookmarks I made. I had to present them somehow and decided to use a piece of cardboard covered with velvet that had come our way once upon a time. I half-hitched each bookmark to a wooden skewer. The only problem was that you had to be careful with the skewers because it was easy to pick up a splinter. I used small clamps to anchor the skewers to the board. I think if I were to do it again I'd get something other than those skewers to use....maybe chopsticks? I'm tending toward a focal piece at one end of the bookmarks. Lots of quartz and stone carved hearts and coins from other countries that have holes in the middle. I'm using 6 strands of a really shiny and silky white cord that my neighbor gave me. There's enough to do a million of these things. But, I have to use beads where the holes are large enough to fit through the braided strand. 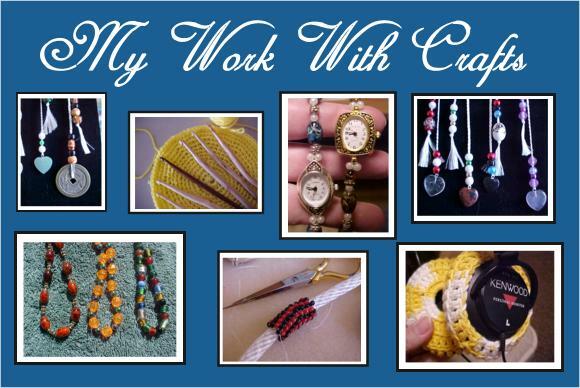 I use a tiny, tiny sized crochet hook and grab one or two strands of the unbraided strands at a time to run through the beads until I've got all 6 through. It's a very laborious process. Ending the bookmarks was a challenge. This thread is so silky that knots just don't hold. I found that if I held the flame of a lighter to the thread and my hand was real steady it would fuse back on itself. The problem there became the tiny little knot of melted plastic was unsightly. So, I experimented with Fimo clay building a bead on the knot. I'd bake the whole bookmark in my convection oven at 200 degrees Farenheit for about 15 minutes or so. That seemed to be enough to set and harden the bead. Then, when it was cool I'd paint the bead with clear nail polish. Yesterday, when I was making the batch for DeeDude I used the clear nail polish to paint the ending knot. Applied sparingly on the parts of the loose knot and then after I'd pulled the knot tight to the outside of it things seemed to work well. Then, I cut the strands about an inch or inch and a half away from the knot to make a small tassel. Have to be careful with the nail polish, though, because too much on the knot will travel right down the strands and make what ends up to be the tassel part gummed together. I can make 2 or 3 bookmarks in one sitting and then I'm pooped out.